Lt Hamilton transferred in from the 32nd CCTS (Combat Crew Training School) in Tucson, Arizona. He brought his own crew CCTS number 1033 with him. After arriving to Alamogordo his crew was split up and the crewmen were reassigned to other crews. So far we only know that 5 of the crew went to the Ogden Crew 606. See the Training link. As for Hamilton himself, he flew to England as the co-pilot for Ogden. Soon after arriving, the staff decided to bump up one of the other pilots, Captain Hurley, to serve as the Squardon Operations Officer. Hamilton was promoted back to pilot to take over Hurley's crew. Hamilton flew with the Hurley Crew on their maiden mission as the co-pilot before taking over the crew. This crew did not fly all of their missions intact. For various reasons, some of the crew had missed some of the missions and their positions were filled by substitutes. While on their first mission, Sgt Mantel's foot got a mild case of frostbite. It was nothing serious, but it did cause him to miss the crew's second mission. We don't know who filled in for him. After the 12th or 13th mission, Sgt Swank lost some feeling in one of his arms from an injury. The medical staff grounded him from duty. Eventually he was sent back to the US for treatment. Sgt Swank was replaced by S/Sgt Albiers from the Bowland Crew R-11. At some point, Lts Bartel and Rodriguez were reassigned to serve as lead navigator and bombardier. They were replaced by Zellmer and Williams respectively. At this time we don't know how many missions each of these men flew with the Group or with this crew. Sgt Cookerow missed at least one mission due to illness. We don't know who filled in for him. Sgt Mahon told us he missed 8 missions with this crew. On 6 of those missions his spot was filled by Sgt Ralph Beaman, one of the radio mechanics for the Group. Beaman eventually was assigned a permanent spot on the Seger Crew R-31. When Crew 604 flew its 30th mission, only Hamilton, Riley and White had flown them all. Their tour was finished and they were able to go home. The remaining crewmen still had to complete their tour. 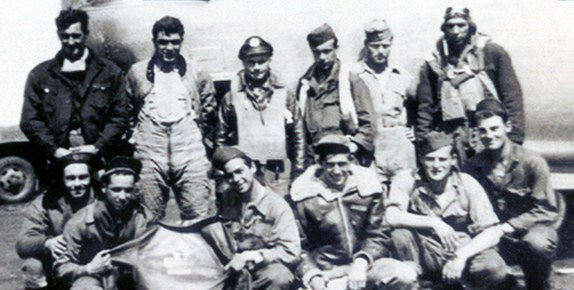 They were transferred to the 801st/492nd BG, 856th BS, to finish up with another crew. We are led to believe that Sgt Mantel only needed to fly one more mission and was able to finish before the tour quota had been raised to 35 missions. We do know that he did finish his tour shortly after transferring. Sgts McMahon, Cookerow and Albiers flew one night mission and five gas hauling missions. But the latter weren't credited as being combat missions until a later date. The three men were reassigned to the 859th BS and shipped off to Italy to fly Carpetbagger missions for the 15th Air Force. These men would end up with over fifty missions each. The mission record below shows all 30 of the missions flown as the Hamilton Crew 604. Individual records for the rest of the crew may be slightly different. The first mission was actually piloted by Hurley with Hamilton sitting in the co-pilot's seat. Page last modified Saturday, October 22, 2016.